The first race of the 2013 WSBK season got off to a fab start as Eugene Laverty took the holeshot from second on the grid, followed by Tom Sykes on the Kawasaki making a good start from the second row. Melandri also made a good start and settled into fourth ahead of Carlos Checa and a stunning start from Leon Haslam from the third row saw him fighting for the top five from the start. Haslam looked keen to make progress and eventually takes Melandri for third. 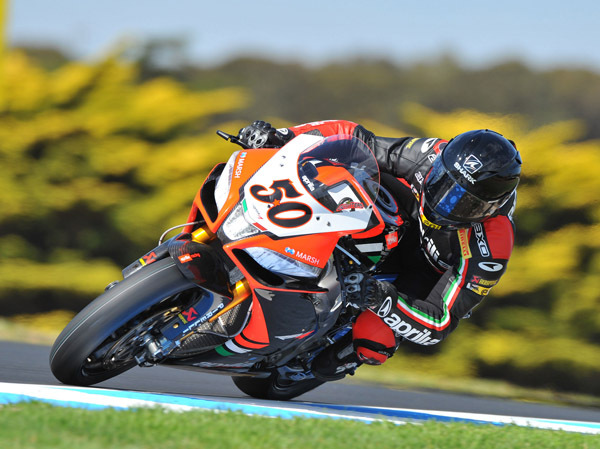 Despite a good start for Althea Aprilia’s Giugliano, the 2011 Superstock 1000 champion retired on lap 3 with a technical issue. On lap 5 the Derbyshire man overtook 2012 runner up Tom Sykes, who then became victim of Carlos Checa at Lukey Heights whilst Aprilia’s Sylvain Guintoli slipped past Marco Melandri. Davies made progress on lap six as he passed his team mate, whilst Eugene Laverty was 1.3 seconds in the lead from Carlos Checa. However, it soon became clear that Frenchman Guintoli was not happy with his team mate running away, putting in a then-lap-record of 1’31.4, however Fabrizio in 9th place soon topped this with a 1’31.323. Guintoli got past Checa into turn 2 on lap ten and started to gap the Ducati, heading straight for his team mate in the lead, Guintoli lapping two tenths faster. Meanwhile, Kawasaki’s Sykes appeared to be struggling as his team mate Loris Baz passed him for 8th place. Marco Melandri used the sheer power of the BMW to overtake Checa into turn 1 on lap 13, Checa attempted to come back on the Italian later in the lap however overcooked it slightly, hitting the back of Melandri sending both riders down. Checa, knocked unconcious by the crash has been flown to Melbourne hospital for further checkups. At this point, Guintoli had caught his team mate up and was shadowing the Irishman, taking the lead into turn 1 on lap 15. Fabrizio had managed to get passed the battling Kawasakis of Loris Baz and Tom Sykes who were engaged in battle with Haslam and Davies, the Italian closing on the factory Aprilias at rapid pace. Guintoli looked to have the race in the bag with 2 laps to go, looking both smooth and comfortable. The same could nto be said for the other two aprilias, who were about to engage in quite the battle. Fabrizio, after several failed attempts made it through on Laverty on lap 20 to see Laverty come straight back at him, however Fabrizio was having none of it as he re-took the Irishman and shot off down the straight. Not only was there a battle for 2nd at this point, but also for 4th betwen Davies and Sykes and 6th between Baz and Haslam. On the final lap, Laverty put it up the inside of Fabrizio in Lukey Heights, the Italian tried to line Laverty up onto the main straight and lost out in what was almost a photo finish. Davies just pipped Sykes to the line for fourth and Baz beat Haslam to sixth. Jonathan Rea was 8th with Leon Camier and Max Neukirchner rounding out the top 10. Lap 13: Checa, Melandri, crash.